Official Red Band Trailer Arrives For BRAID! If you Love a good tale of money, madness, and murder then you will enjoy what we have for you today. Writer/director Mitzi Peirone prepares for the release of the upcoming psychological thriller titled BRAID. We have the crazy Red Band trailer waiting for you below. 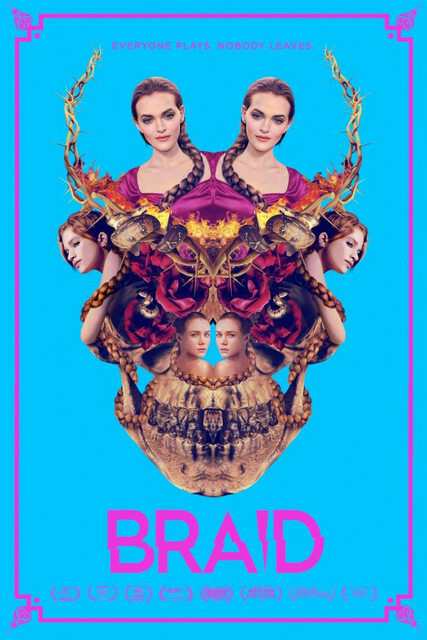 BRAID stars Imogen Waterhouse, Sarah Hay, and Madeline Brewer. "Petula Thames and Tilda Darlings are two self-proclaimed artists turned dealers on the run. After mishandling thousands of dollars in narcotics, the girls are given forty-eight hours to repay their vengeful drug lord. Fleeing town, they head to the desolate mansion of wealthy childhood friend, Daphne Peters with their sights set on house’s safe. Daphne, living secluded in the manor, has grown into a dangerous schizophrenic and prisoner of the fantasy world the three created as children. To abscond with her money, the girls are forced to take part in Daphne’s twisted, bloody game of make-believe, a demented maze of hallucinations, role play, torture...and murder." BRAID will be released on February 1st from Blue Fox Entertainment.